Nature has provided us with lots of antimicrobials. However, given the rapid increase of antimicrobial resistance, there is a need for the development of new-to-nature antibiotics. Lantibiotics are an interesting option. Molecular biologists from the University of Groningen and their colleagues in Switzerland and Germany have now developed a pipeline to create and screen large numbers of new lantibiotic peptides. A description of the method and the first results were published on 1 April in the journal Nature Chemical Biology. Kuipers and his colleagues from the ETH Zürich (Switzerland) and University of Regensburg (Germany) devised a system to create large numbers of new lantibiotics: ‘We synthesized DNA strands coding for the different rings and combined these genetic modules to form lantibiotic genes coding for random combinations of five rings.’ The gene library that they created contained around 14,000 synthetic genes. The next step was to screen the gene products for antimicrobial potential. To do this, they modified a technique developed for enzyme screening, based on micro-alginate beads. Inside these beads – each around 70 micrometers in diameter – bacteria can grow. The genes from the library were put into a producer strain, containing a red fluorescent marker. ‘We diluted these bacteria so that we would end up with one or zero cells per bead. 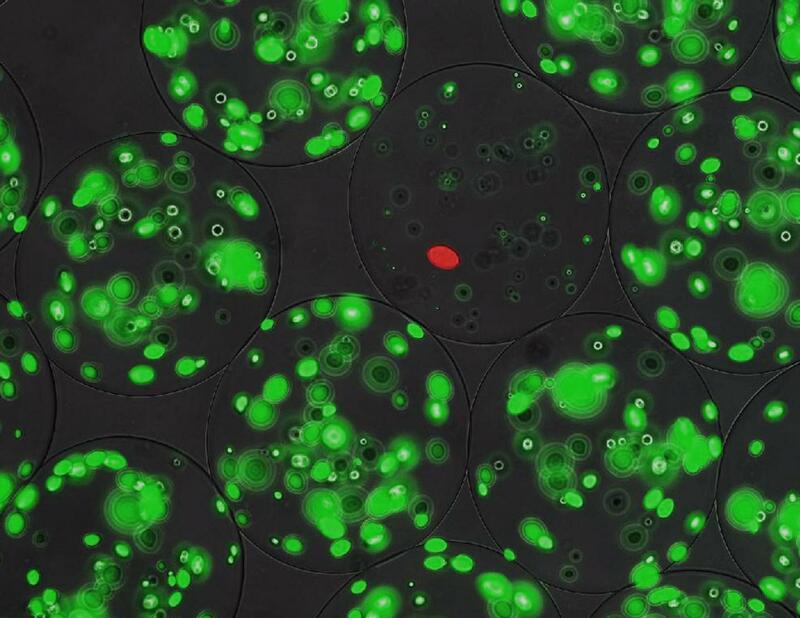 We also added a target strain that could be killed by the lantibiotics; those cells were used at a higher concentration of around 50 per bead.’ The target cells carried a green fluorescent marker and produced a peptidase that activated the precursor lantibiotics secreted by the producer cells. In the end, a series of lanthipeptides with a strong antimicrobial effect was isolated and characterized. ‘We found peptides with different antibiotic activities, although several peptides looked a bit like nisin or epidermin. It turned out that we had even recreated nisin in our gene library.’ The experiment provided a lot of information about the structure-function relationship of the different rings in the lantibiotic peptides. This can now be used for a rational design approach to create new antibiotics.